As the gym doors open, the sound of bouncing basketballs, shoes thumping and squeaking on the hardwood and loud voices and screams from players, coaches and fans fill the air. It’s hoops time again and our local schools are right in the middle of the action. With its core values of commitment, character and compete, Inglemoor’s girls are set at making a strong run at the state tournament, according to head coach Kristina Schumacher. “We are a defensive-focused and selfless program that our community can feel proud of,” Schumacher said. Top returners include senior Jenna Troy (5-foot-10 guard), who has committed to play at Central Washington University next season and sports a relentless attitude and shines in all aspects of the game, Schumacher said; senior Eva Taylor (5-5 shooting guard, who is also big on defense) and junior Lucy Young (a 5-8 point guard, a vocal leader with a deadly 3-point shot). There’s also Katelyn Laccinole, a junior point guard who plays big at 5-3, the coach said, and is confident. On the newcomer front, there’s sophomore Abby Haller, a 5-11 forward who is a solid rebounder, shooter and blocker. • Play hard, play defense and play together — that’s what boys head coach Greg Lowell and his players are striving to accomplish this season. “The kids are working hard and excited about the year. Strengths are returning players, good leadership and team play,” he added. Returning to the hardwood for the Viks are seniors Calvin McDaniel (5-11 guard) and Blaine McGoorty (6-5 forward), juniors Zach Shimek (5-11 guard), Brady Casto (6-2 guard), Tim Donahue (6-4 forward) and Peter Hansen (6-4 forward) and sophomore Aidan Bennett (6-foot guard). New to the Vik varsity scene are juniors Adil Lalji (6-6 forward) and Dawson Tucker (6-foot guard) and sophomore Logan Russell (5-11 guard). Ron Bollinger’s boys return to the hardwood after finishing 20-3 last year and winning the 4A KingCo championship, 49-43 over Mount Si. They were 2-2 at press time — featuring wins over Kamiak (52-39) and River Ridge (74-41) — and are setting the bar high again, according to Bollinger and his staff on the team’s web page. 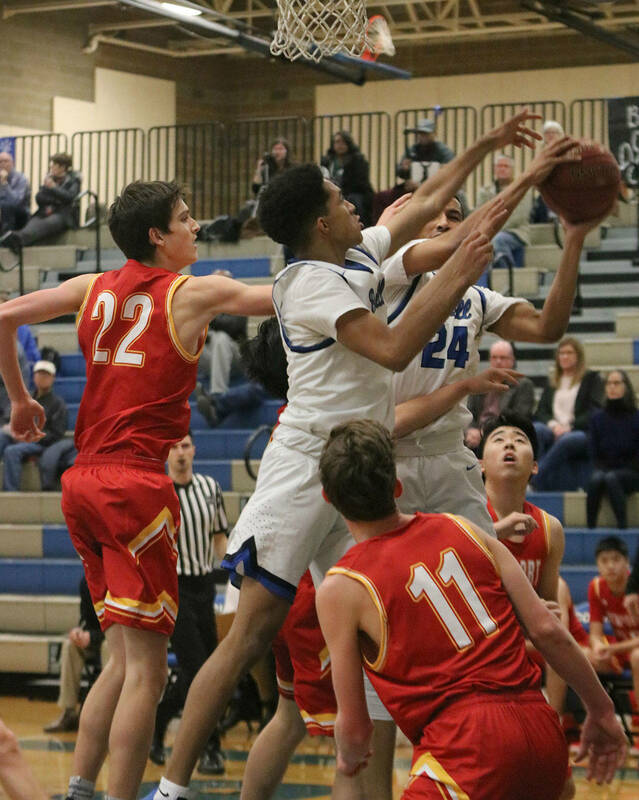 “Through teamwork and hard work, this team has the ability to compete with any team in the KingCo Conference and throughout the state,” they said, noting that the enthusiastic Cougars will display exciting fast-break basketball. The Bothell and North Creek basketball teams will be playing and hosting a Toys for Tots drive on Dec. 14 at Bothell High. The varsity girls will play at 6:30 p.m. and the varsity boys will follow at 8 p.m.
Bothell returns five varsity players from last season in seniors Spencer Wright (6-3 guard), Austin Cartwright (6-2 guard), Jacob Hamaker (6-foot guard), Quentin Young (6-foot wing) and Ethan Nelson-King (6-4 wing). • Growing and learning from each game and working as a team will be the keys to Bothell’s girls reaping success this season. “The goal is to begin building a team culture around work ethic and a team-first mentality,” said head coach Erin Berger, noting that the fairly young team is full of grit and desire. Out front on the returner list are seniors Nicole Leadley (5-8 guard), Jayda Dixon (5-10 guard) and Evie Smith (5-11 post) and sophomore Devon Lipkin (5-8 guard). Top newcomers are freshman Rylie Pare (5-8 guard) and sophomore Amara Iheke (5-9 post). With four returners at 6-1 and above, North Creek’s boys are anticipating a competitive season and strive to qualify for the district tournament. “Even though we are still young, we feel like we are a deeper team this year at all positions and our defense will be a key to a successful season,” said head coach Wayde Knowles. The Jaguars’ big guys are senior Andrew Mazzawi (a 6-6 wing/post), sophomore Garrison Kepley (a 6-5 wing/post), sophomore and football quarterback Jack Charlton (a 6-3 guard/wing) and sophomore Ethan Boyd (a 6-1 guard). • On the North Creek girls’ side, they aim to play pressure defense and uptempo basketball and have fun along the way. “Our biggest strength is the hard work the players have put in to improve their skills and build team chemistry,” said head coach Calvin McHenry, noting that the girls are gunning for a playoff appearance this season. Returning starters who will lead the way are 6-footers Caitlin Monten (forward) and Kelsey Hudson (guard/forward) along with Lexi Ducheane at 5-7 guard, all seniors, to go along with sophomore Kyra Mickey at 5-9 guard. Other returners are Emma Unruh (6-1 sophomore forward), Allison Bianchi (5-7 sophomore guard), Lauren Grout (5-8 junior guard) and Jessica Clipper (5-5 senior guard), and two newcomers are junior guards Mia Kosoglow at 5-4 and Brandi White at 5-8. Last year’s league co-most valuable player Irena Korolenko (a 6-foot junior guard who averaged 20 points per game in 2017-18) is back leading the lady Eagles along with fellow returners Sela Flynn (a 5-11 senior post who averaged nine points and nine rebounds per contest last year) and Abby Perrigoue (a 5-3 sophomore point guard). New to the squad this season are junior Parker Reymore (a 5-5 guard) and sophomore Jaden Chappell-Waters (a 5-11 post). “We expect to be competitive in every game, and finish near the top of the league. We will have a successful season if we play together and play active defense,” said head coach Brittani O’Malley. The coach aims to lead her players in competing, being united and having fun. • With six returning players on board, the Eagle boys are strong in the depth department. Despite being fairly young all around, though, they should be competitive in league this season, said head coach Adam Lynch. Leading the way in the returner department are senior Dawson Drews (6-5 forward), junior Luke Allen (6-2 guard) and a slew of sophomores in Ryan Baker (6-4 forward), Trenton Lynch (6-2 guard), Matthew Attalah (6-2 guard), Matthew Duffy (6-foot guard) and Bret Henson (6-3 guard).